As artist-in-residence at the Guy Miller Homes, a HUD-funded urban housing project for the elderly, Lacy developed a years-long friendship with Evalina Newman. Over several years they designed a series of activities, installations, and performances that grew out of their relationship and New- man’s activism in her own community. 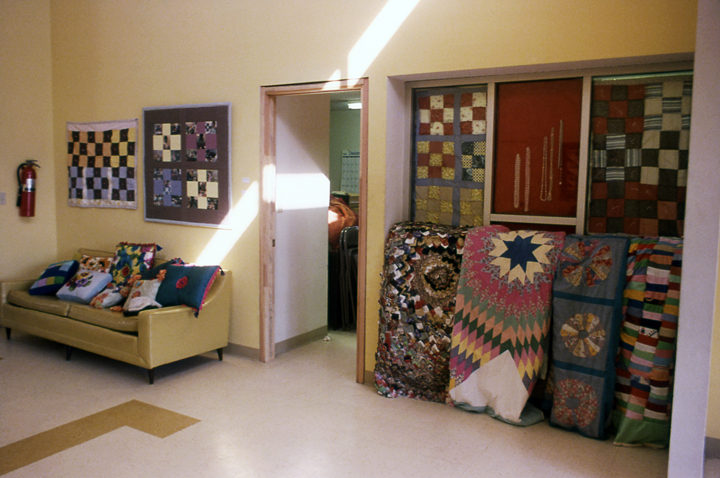 The first installation was initiated by Newman to organize elderly residents through the creation of a Quilt- ing Club where residents made small lap quilts for senior citizens’ homes. The club presented, with Newman and Lacy, a portrait of the community—its creative expressions (women practiced a series of crafts, including quilting), its organizing, and its security needs. They recruited politicians, police representatives, Los Angeles artists, and local activists to an art exhibition in the recreation hall/gallery. Lacy’s “photo quilts” were displayed alongside residents’ quilts, pipe cleaner wire poodles, doll’s head Kleenex box covers, and crocheted potholders. Buchanan at a gallery in downtown Los Angeles where an audience waited. Hanging up the phone, Nancy announced the piece had begun, showing slides of Newman and Lacy and playing a recorded phone conversation where Newman said her heart condition would prevent her from riding the bus in that part of the city. Newman walked Lacy to the bus stop, with a small pistol in her apron pocket. Lacy rode the city streets for over an hour; a brick shattered a window but the driver did not stop. She exited the bus on a desolate downtown street and ran the final mile to the gallery. The performance was completed when Lacy arrived without fanfare, at a party in progress, and called Newman. 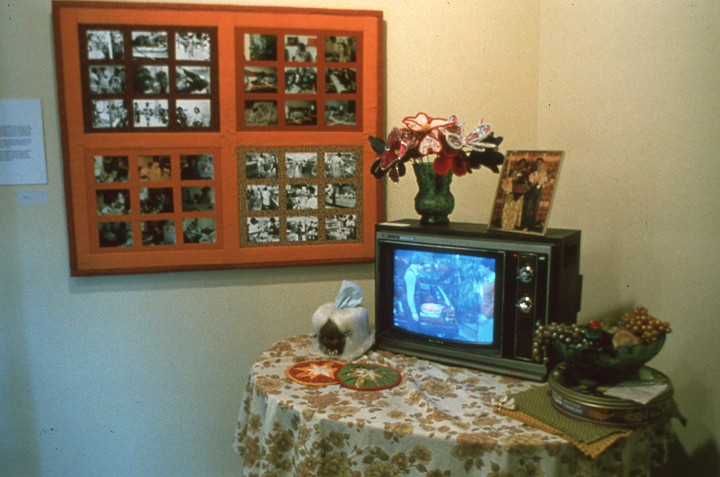 In a final installation in 1980, Lacy commemorated Newman’s premature death from heart failure by recreating her living room with personal artifacts donated by residents. Surrounded by photographs of Newman, her artwork, an unfinished quilt and her favorite furniture, a sewing machine chattered perpetually, propelled by an unseen foot. Residents of the Guy Miller Homes attended the opening at the Woman’s Building to honor Evalina Newman. Projects curated by Jim Woods and/or self-curated, Guy Miller Homes, Los Angeles, California.